I have decided I might have an obsession with food. I’m not sure if this is a pregnancy thing. I’d love to say it is, but truth be told, I was taking pics of food and reading cooking blogs and pinning Pinterest food groups before I knew Gus was on his way. So I can only blame so much on him. Some foodie items I’m especially thankful for this week are…. I made this on Tuesday and we enjoyed it that night for dinner, on Wednesday as sandwiches, and tonight it’s making it’s final reappearance in a big pot of vegetable-beef stew. Which is perfect since the temperature went below 50 today and I think I’m going to freeze. 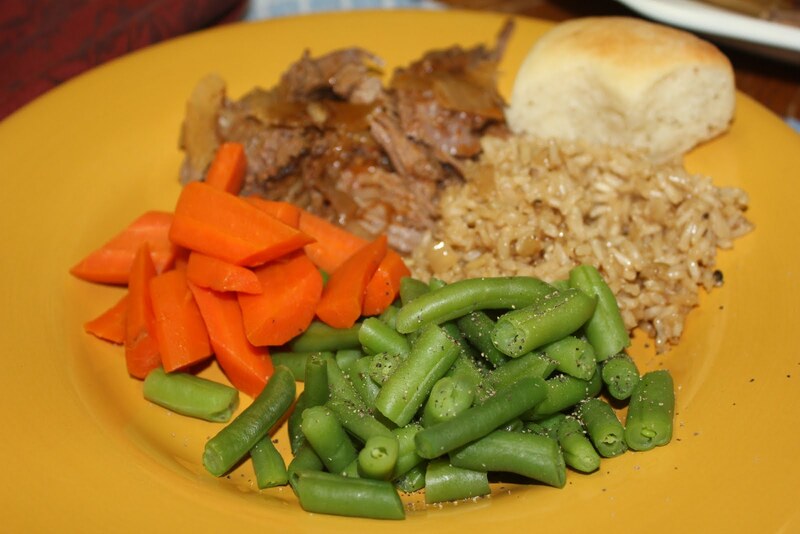 Here’s ours complete with honey-butter steamed carrots, steamed green beans, Italian brown rice, and yeast rolls. I’ve been trying to cut back on my consumption of the house wine of the South. But after the incident on Tuesday, I just had to cave. And I’m raising my girls right. Annabelle was not happy that I ordered her a blue slush instead of a sweet tea. I really want to make this cookie cake recipe, but Joshua only wants his normal cookies. And he doesn’t like peanut butter unless it’s in a Reece’s cup, so that means that I would be eating the majority of this myself because I can’t feed all that sugar to my kids. Alas, I think I’ll have to wait for an event to make this and make do with the Nestle Tollhouse recipe for cookies until then. Which you know, I could just slather peanut butter on…. Can you tell I’ve decided to calm down about my pregnancy weight gain and eat in moderation? The result of which is I’ve hardly gained any this month. But don’t worry, Baby Gus is doing just fine. Link up over here with Julia and be thankful for anything random today. I had pinned that chocolate cookie recipe but don't dare make it. So, if you make it I'll help you eat it. What a combo – peanut butter & chocolate. I've got just the occasion for that chocolate chip cookie cake recipe… it's called your-friend-julia-lives-in-kentucky-and-needs-you-to-mail-those-to-her… pronto. that pot roast recipe looks pretty amazing too… but no need to mail that too… the cookies will be fine. mkay.thanks.